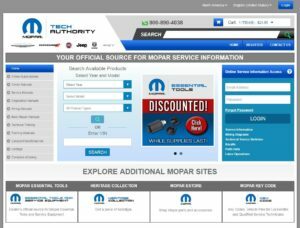 It seems as though a collision repairer using FCA’s free collision repair procedure website instead of paying for a subscription to Mopar’s complete repair procedure site isn’t going to have the necessary information for a proper repair, based on information presented during a Friday Collision Advice-FCA webinar. FCA provides auto body repair manuals for free, but charges for all other service and repair instructions — including versions of the collision repair instructions equipped with active hyperlinks for easy references to related procedures. The paid site starts at $24.95 for a day; a year costs $1,800. The webinar hosted by Collision Advice CEO Mike Anderson, which also featured FCA collision marketing manager Erica Schaefer; FCA body, chassis and paint global service lead Dan Black; and asTech industry relations director Jake Rodenroth illustrated some of the differences directly and indirectly between the free Mopar Repair Connection site and the paid Mopar Tech Authority site. Anderson said he preferred the paid version of the website for its interactivity and mentioned that it even included embedded videos illustrating certain procedures. The free site merely features static PDFs derived from the interactive versions on the paid site. 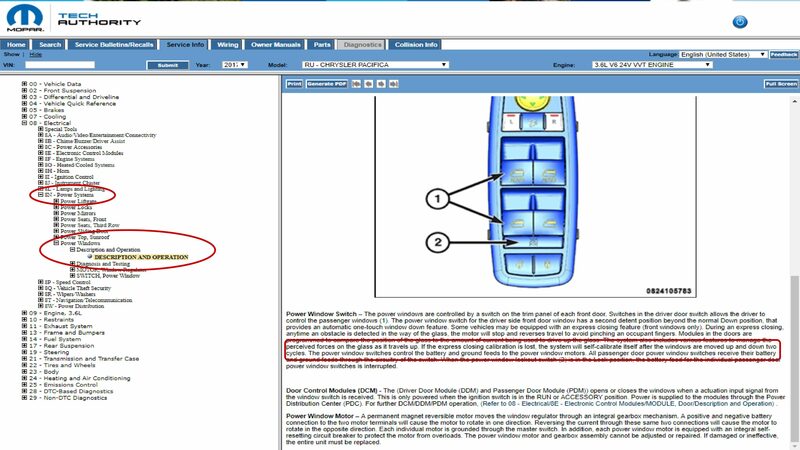 More importantly, many of the necessary procedures for a collision repair — such as disconnecting the battery or removing a door — are housed within the Service Information tab of the paid site, according to Anderson. Important details like wiring diagrams live there, as do instructions for recalibration. This can include systems you might not have even considered; for example, Anderson showed an FCA diagram for the 2017 Chrysler Pacifica that states that a shop must roll the power windows up and down twice to self-calibrate the system. Anderson raised the specter of a customer’s pet or child sticking part of their body out the window and “it rolls up on them” because of a shop’s omission. That information can’t be found on the free site. The hard wired circuits between modules and components related to the Supplemental Restraint System (SRS) may be diagnosed using conventional diagnostic tools and procedures. Refer to the appropriate wiring information. The wiring information includes wiring diagrams, proper wire and connector repair procedures, details of wire harness routing and retention, connector pin out information and location views for the various wire harness connectors, splices and grounds. However, conventional diagnostic methods will not prove conclusive in the diagnosis of the SRS or the electronic controls and communication between other modules and devices that provide features of the SRS. The most reliable, efficient and accurate means to diagnose the SRS or the electronic controls and communication related to SRS operation, as well as the retrieval or erasure of a DTC requires the use of a diagnostic scan tool. Refer to the appropriate diagnostic information.